Advance Fenestration specialises in the design, manufacture and installation of architectural aluminium fenestration. We offer a wide range of products ranging from traditional window and door systems to European contemporary style and energy efficiency. Our range of products is custom manufactured at our factory in Edenvale and offers a solution to all your needs, be it the look, feel of operation, security or performance of product. Advance Fenestration was founded by Lucas van Wyk and Eben Rootman reacting to a large export order that kick started the company that is today. From humble beginnings the company has grown in stature now competing in the town house, high end residential, commercial and retail market segments in South and Southern Africa. We are proud with what we achieved in the time that we have been in business and feel that our CV confirms this. Both Lucas and Eben are seasoned in the industry beyond Fenestration and understand the importance of programme and follow on trades. We believe that our team consist of focused, experienced, reliable and successful individuals that bring a personal touch to all our projects. We continuously strive to be leaders in our industry and have a passion for our community. Advance Fenestration is a proud contributor to the Wispeco trade and internship program for the deaf.We offer these individuals practical experience after their learner ship that they can use to their advantage by either joining Advance Fenestration full time or applying their experience elsewhere. The owners love dogs and donate time and financially to animal shelters. 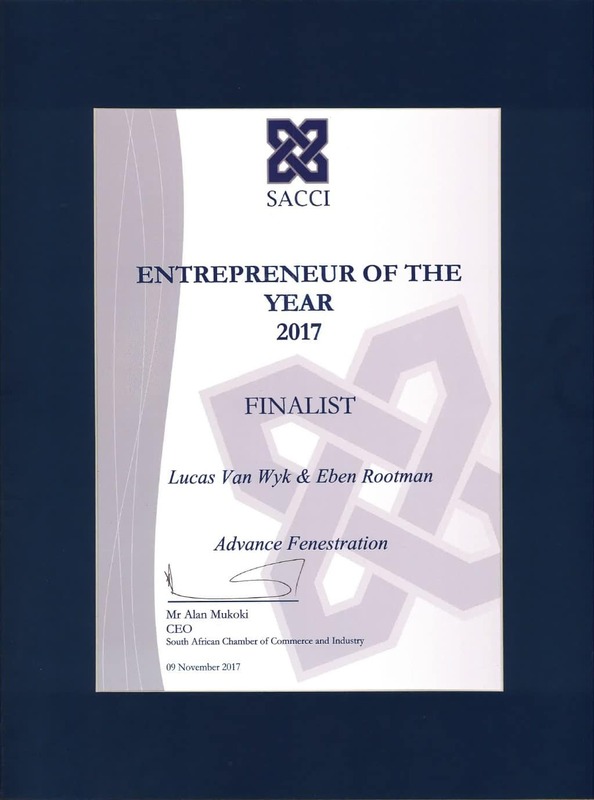 Advance Fenestration was honoured at the Sanlam/Business Partners in 2016 competition as being a finalist in the Medium Enterprise Category. The prize giving ceremony is on the 1st of September 2016. We are thrilled and excited!